I know, I know, “Annie,” right? I don’t know what to tell ya, man! I’ve seen three stage-mounted musical productions of Annie in my lifetime (2 of which were great, 1 of which was sufferable), but this movie is a delightful surprise. (Now, as is the case with all movie reviews, this movie review is CONTEXTUAL. When I’m reviewing a “kid’s movie,” I’m thinking of it in that context. When I’m reviewing a “horror film,” I’m reviewing in that context; I’m not comparing Annie to Citizen Kane, The Godfather, Raging Bull or Shawshank Redemption, mind you.) But as for Annie, well, it begins and ends strongly with lots of zip and zest, the acting is fun and fresh, and every single song you know (or think you know) has been recomposed. 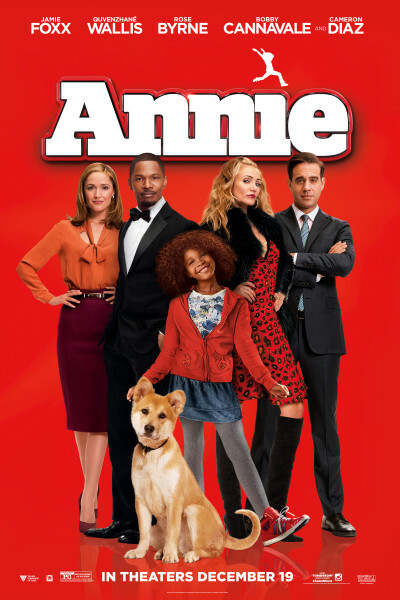 Annie is played by the “Beasts of the Southern Wild’s” Quvenzhané Wallis, and she’s effortless in this role. Cameron Diaz is, regrettably, the weak link in the production, but oh well, people don’t show up for her acting, do they? If you’re looking for a great family film that’s bouncy and uplifting, this is one to see. Be ready, because once it begins—it won’t release its hold on you.